Today’s Looks of the Week round-up will be focusing on the chic Winter trend of wearing white – Whether it’s a head-to-toe look or just a fabulous piece or accessories. Male or female, Summer or Winter, white can be hard to pull off, it takes some serious style chops to make it work well. Have you had time to try out the Winter White trend yet this chilly Winter season? Which of the looks above inspires you the most? Nothing quite like a red carpet event to bring out the fashion drama in Hollywood! Here are my favorite picks from the main event, as well as the more low-key events that preceded it. It’s casual for the red carpet, but it’s a great Little Black Dress that’s flattering, chic, and suits her to a T so there’s nothing to complain about. This is a beautiful color on her and the subtle draping and one-shoulder neckline both look great on her. This is fun & sassy, two things that the red carpet frequently doesn’t see because people are so afraid of ending up on a worst dressed list. I like that the cut and silhouette are prim and ladylike while the eye-catching color is fun and youthful – It’s a great combination. I love a little white dress when it’s worn right just and this one is pretty spectacular – I love the interesting neckline and bust. This is a very cute, flattering sheath dress – Someone petite like Ginnifer can really make this style work. You know me, I’m a sucker for a cute shorts suit. The double-breasted jacket is too perfect and buttoned-up heart print blouse was a great choice. She cuts quite a figure in this dress – She’s just oozing old school Hollywood glamour and elegance. J’adore! This is nothing short of phenomenal – I love the cut, silhouette, and the amazing disco-futuristic fish scale like sequins. She looks amazing! Miss Tina Fey isn’t one of the women who usually pops into my mind when I think of red carpet all-stars, but this dress is killer. It’s a gorgeous color on her and the embellished neckline is perfect – interesting and unique but not too dramatic. I love a print on the red carpet and I think this gown is just beautiful. She looks radiant and chic, well done. When you want drama – You go to Zac Posen. January Jones loves a fashion-forward look and this Posen gown really served up the drama last night. Very few women could have pulled this off but she looks great. I don’t have the slightest idea who this actress is, but I made an audible “oh” when I saw this gorgeous tangerine number that I knew I should include it! Clearly Allison is favoring the great Oscar de la Renta right now and I have to say that I fully support that choice in this case. Wow! Stunning color and I like that between the all-over pleating and the unique neckline it’s not a basic red gown. Striking color and suits her perfectly. I think that the belt and collar were right on point but where’s her cuff??? What a gorgeous, unique dress. I love the detailing and I’m glad that she held back on the accessories and let the dress take center stage. Fabulous color! This goes to show you that a killer color can overcome a basic – even boring – style. Kerry Washington was another sequined stunner this year, her Vivienne Westwood gown definitely have Lucy Liu’s Versace number a run for its money! I was thrilled by all of the stunning dresses on the red carpet this year – Everyone did such a fabulous job choosing their gowns. But if I had to pick my favorites from the dresses above I think I’d have to go with Lucy Liu in silver Versace, Julianne Moore in yellow Dior, and Allison Williams in green Oscar de la Renta. Well done ladies, well done! What were your favorite dresses from the red carpet? Did you like all of the bright citrus colors and brilliant jewel tones or do you miss all of the lace and sheer fabrics from last season? Wait – Is that an oxymoron? Well anyway, here’s another exciting Looks of the Week post featuring some end-of-Summer looks as well as some outfits that will have you digging through your closet to find your Fall & Winter clothes. Enjoy! I love the retro 70’s vibe of this look – From the floral blouse to the flared denim mini to the platform booties. Absolutely fabulous! This is such a fun, well put together look. One of my favorite parts of this great mix n’ match look is the fact that she paired her skirt & blouse combo with tennis shoes rather than heels. It’s funky and original – J’Adore! A tunic and jeans are anything but boring when The Glamourai gets ahold of them! This look is all about great fitting, flattering pieces mixed with high-impact accessories. That clutch, that necklace, those glasses – Killer! Cute cute cute. I love that this plays on the menswear trend but is still feminine and totally unique. KILLER! I love love love this look. From the chic black & white color scheme to the skirt’s silhouette to the fabulous IMUSTHAVE studded Celine ankle boots. Both of these looks are killer! I love these Victoria Beckham inspired styles on Kate – Utterly chic and utterly flattering. One thing that I truly admire is when a woman can make a menswear piece really work and look feminine and stylish. This sleeveless pocket vest is anything but a shapeless “stolen from the boys” piece, it suits her perfectly and was paired with a great pair of cropped purple trousers and fabulous accessories. While I love a great retro dress, the accessories here really caught my attention. That bag is fabulous and I love the double cuff, such a great look if you can pull it off (and not look like Superwoman!) And my favorite piece? That vintage-style gold & pearl ring. J’adore! One of the things that I appreciate most about Shea from Cheyenne Meets Chanel is that she really sticks to her style. All of the looks that she posts shine with her California hippie, boho girl, flower child roots. This is a beautiful example, she really shines in this flowy, Summery maxi dress. Which look is your favorite? Are you still in full-blown Summer mode wearing skirts, shorts, and dresses, or have you started to work Fall items into your looks? I was pleasantly surprised when I looked at the photos from the 2012 Teen Choice Awards Show red carpet. Normally an event like this might be too young, but the fashion was fun and Summery, great examples of how to dress up in warm weather. Cute prints, bright colors, and fun, relaxed silhouettes all made an appearance as the fashionable young ladies on Hollywood strutted their stuff. So without further ado, here are some of my favorites. I’ve been having a love affaire with bright shorts this summer and here’s yet another pair that I’m now coveting. Such a fun, sassy look for the red carpet! This is a very well put together look for a younger gentleman. While others his age put forth zero effort and arrive on the red carpet in jeans & t-shirts, he put together a stylish and eye-catching look. Well done! This was one of my favorite dresses, the color looks fabulous against with her skin tone and the cut is perfect for her age and for her figure. Couldn’t have picked a better dress for her! Cute. Flattering. Colorful. Summery. What more could you ask for in a suit? It’s always nice to see what the non-Tweens put together for these types of events, and Miss Portia de Rossi looks chic and fabulous here in all black. As always, a home run. The print and color look great on her and those shoes are such a fun choice. And while very few of us mere mortals can make a midriff baring top work, I think Zoe’s choice make this frock Teen Choice-friendly. This Mary Katrantzou dress is fun and eye-catching, what more does a girl need at the Teen Choice Awards? As I’m sure you’ve discovered, I have quite a soft spot for Alice + Olivia. And as usual, I absolutely adore this dress. It’s a dramatic pattern and the fabric and silhouette are a little retro, but it’s still youthful and perfect for this type of event. There were some truly great printed dresses on this red purple carpet. Dresses that could easily go from day to night during the Summertime with a change of accessories. This is another example of a too cute dress that I would happily wear! Sweet & stylish, per usual. I’d love to see her deviate from her usual types of looks, but you can’t deny that she looks beautiful and put together here. Polished and chic. Definitely the route I would have picked for her, she was stunning in Cannes at the AmfAR Gala and this is a continuation of that classic style she can pull off so well. Glittery platforms were the accessory de jour at this event, apparently Studio 54 is having another moment. The color, fit, and textures of these pieces work well together and look really polished. And last but definitely not least… True rock stars! Love the shades. Love the leather. Love the blazers. Love the vests. Love it all. They look fabulous together, really in sync fashion wise. Want to trade your chic white winter coat for a crisp, stylish white dress when the weather warms up? EatBreathFashion.com has a breakdown of the pieces you’ll need to recreate Katherine Mcphee’s recent adorable white look for her Smash premiere. You can also see ShopBop.com’s white dress offerings here – they have all different styles, lengths and fabrics. Behind the scenes video for the Louis Vuitton Spring/Summer 2012 advertising campaign photo shoot – Pretty Pretty Pretty! Need some more inspiration for your Spring/Summer wardrobe? Check out the styling of the looks that will hit Zara in March or the Club Monaco Summer 2012 lookbook here. You can also read about Rachel Bilson’s Must Have picks for the upcoming warm weather here. Did you get a chance to review my photos and reviews from New York Fashion Week Fall 2012 shows & street style? You can also see FabSugar’s round-ups: Best Coats, Top Trends & Standout Shoes. Interested in giving running a try? Strength Running has the basics for you – How to Start Running from Scratch: A Complete Beginner’s Guide or read FitSugar’s How To Run Pain-Free. Upset stomach? 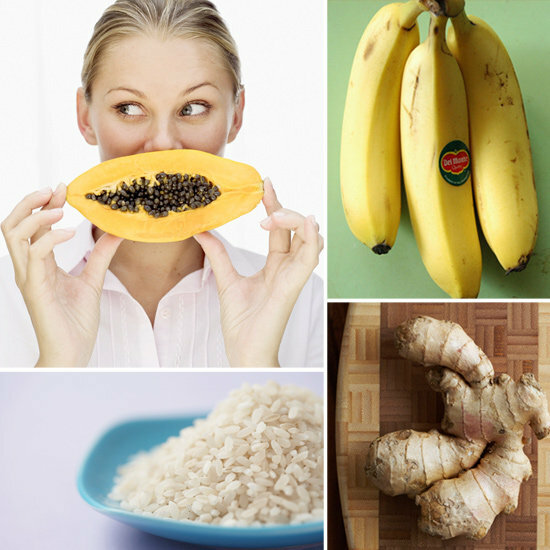 Rather than reaching for the pink stuff, check out this article on 7 Foods To Help Ease An Upset Stomach from FitSugar. Want to add a healthy dose of fiber and omega-3s to your diet? Try flax seeds! FitSugar has 8 Recipes Made With Flax. Confused by which oils you should be using when you cook or interested in trying something new? Check out The Cooking Oil Comparison Chart from Eating Rules. Pressed for time but want to squeeze in a quick endorphin boosting, calorie burning working? Try FitSugar’s 10 minute leg workout or Sports Illustrated model Julie Henderson’s Power Body workout with fitness guru David Kirsch.